Frank D. Ahlenius, age 85, of Knox, passed away Wednesday, March 27, 2019. He was born February 25, 1934 in Chicago to John Ahlenius Sr. and Marie Rostall Ahlenius, both deceased. He was a Veteran having served in the U.S. Army and was a long time member of the Operating Engineers Union Local 150. 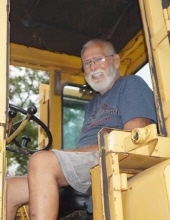 He loved running heavy equipment and was especially know for the great love of his family. On January 10, 1980 he married Judy Kobak Ahlenius, she survives. Also surviving are his children, Mary James (Denny) of Knox, Kathleen Medesi (Dan) of North Judson, Frank Ahlenius Jr. (Laura) of Knox, Amy Ahlenius of Knox, Maureen Wells (Leighton) of Valparaiso, Samuel Ahlenius (Melinda) of Knox and Christina McGrath of Indianapolis, a brother, Phil Ahlenius of Knox, 13 grandchildren and 13 great grandchildren. He was preceded in death by two brothers, Robert and John Ahlenius. Private family services will take place at a later date. To send flowers or a remembrance gift to the family of Frank Ahlenius, please visit our Tribute Store. "Email Address" would like to share the life celebration of Frank Ahlenius. Click on the "link" to go to share a favorite memory or leave a condolence message for the family.